In my previous post, I said that there are strong parallels between the proper approach to the biblical texts when we're studying the scriptures, and to scientific data when we're studying nature. For the Bible and nature are two halves of God's unified revelation, two books written by the same Person for the same purpose. In both cases, we treat the text or the data with the utmost respect. They are sacred in a way that mere interpretations or theories could never be. For the text or the data judges the interpretations or theories, but they are themselves infallible and beyond reproach. By "infallible", I mean that the biblical text is the actual record of how God actually worked in human history, like scientific data is an actual record of what nature itself actually did in an experiment. In both cases, this infallibility does not mean that they don't need to be processed or interpreted, but it does mean that our interpretation must be based firmly on the text or the data. FIRST, WE ARE TO APPROACH THE BIBLE WITH COMPLETE FAITH IN GOD, trusting in the Holy Spirit to illuminate its text and enlighten our minds. We must believe that God reveals himself through the Bible and enables us to understand that revelation. Without this faith it is impossible to sensibly interpret the Bible, just as it is impossible to do science without faith in its fundamental axioms. The same faith in a perfect God who wants to reveal himself to us underlies all our attempts at understanding, whether we're trying to understand the Bible or nature. SECOND, WE ARE TO INTERPRET THE BIBLE IN CONTEXT. Here, I mean "context" in the entire range of the word - from the context of what a word means in a language (its definition), to the context of how that word is used in a sentence, to the sentence's placement in a paragraph, to the context of a paragraph in a chapter, a chapter in a book, a book in a sequence of books, and so on, all the way to placing a book in its proper literary genre, and its proper historical and cultural setting. Depending on all this context, we may interpret a particular word or a passage or even a whole book literally or figuratively, with different degrees of applicability for a specific question that faces us today. This is the historical-grammatical method of Bible interpretation. It's the way to treat the infallible word of God with proper respect, by interpreting its message in the fullest context possible. The same is true in science: we interpret the data in the fullest context possible. If we have "data" only as a sequence of numbers, it's meaningless. We must ask context-related questions, such as "what are the units on these numbers? What are their uncertainties? What instruments were used to acquire these numbers? Where were the samples collected, and by whom? How were the samples treated beforehand? What was the goal of the experiment for which these numbers were generated?" If we do not interpret the data in the fullest context possible, we are not treating it with the respect it deserves, and we are likely to err in our conclusions. For both the biblical text and the data, the utmost respect accorded to them requires that we interpret them in their proper context. THIRD, WE ARE TO INTERPRET THE BIBLE IN A LOGICAL, SELF-CONSISTENT FASHION, and thus use scripture to interpret scripture. For instance, we use the clear, specific passages to interpret vague, general passages. We do so because we believe the Bible is the infallible work of our infallible God, free of any contradictions or errors. This is the same approach we take in science: we build our theories in a logical, self-consistent manner, using more specific, more precise data to refine our theories in areas where they are vague. We do so because we believe that nature, being the work of God, is free from contradictions or errors. Remember that data cannot contradict data; it can only be misinterpreted. Only theories can contradict data or one another. To illustrate this point, consider a quantum mechanical experiment where we measure electron spins in a given direction. We prepare two utterly identical electrons in exactly the same way, and perform the exact same measurement, but then get two different results - two different pieces of data. Did the data just contradict itself? Surely, if it were possible, this would be clearest case for data contradicting data. But, of course we don't interpret this experiment that way: we say instead that the data only contradicts a classical interpretation of the universe, but not one another. By finding a better theory - namely, quantum mechanics - we can resolve this apparent contradiction in data. Other experiments designed with more specificity can further help us refine our theory. We are to interpret the Bible in the same way: when we run into passages that seem to conflict with each other, we don't simply give up. We instead say that it's only our current interpretation that leads to a contradiction, and search for a better interpretation. Other passages which are more specific and clear can help us further refine our new interpretation. 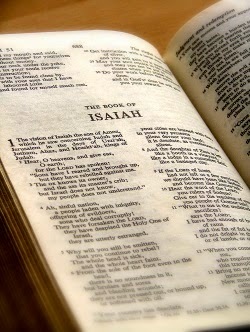 In this way, our faith in the Bible as the work of our infallible God helps us to better understand it. FOURTH, WE ARE TO LET THE BIBLE SPEAK FOR ITSELF, rather than reading our preconceptions into it. We therefore look at the Bible holistically for our interpretations: we are not to cherry pick the parts of the Bible that suits us while ignoring the parts we don't like. We also don't base important interpretations on a single verse while ignoring the sense of the rest of the scriptures. Note that this does not mean that we have to follow every single command that God gave to different people in different circumstances. That would quite clearly violate the rule of interpreting the Bible in context. However, it does mean that if you decide that a particular verse doesn't apply in a particular situation, this decision must make sense in the context of an interpretation that agrees with the Bible as a whole. For example, Jesus once commanded a rich young man to sell everything he has and give the money to the poor. Are we therefore also subject to this command? Well, since Jesus gave this command to a specific person, in the context of this person essentially saying "am I not already perfect? ", we can reason that this command does not apply to all Christians. Furthermore, this is nearly the only time that God asks someone to give up their entire wealth, but there are numerous other times where God asks someone for only a part of their wealth, or commends giving everything as exceptionally praiseworthy, or blesses someone by making them wealthy and letting them keep that wealth. This is further evidence that this "sell everything" command doesn't apply to everyone. We therefore conclude that this command was given only to the rich young man, tailored to his specific situation and spiritual condition. This is a correct way to interpret the Bible. It is not cherry picking. We've decided to "ignore" a particular command, but that makes perfect sense in the interpretation of the Bible as a whole. What you cannot do is to simply say, "well, the Bible is thousands of years old and things were different then, so I don't have to give anything to the poor". That is an interpretation made to avoid the clear and universal command for all Christians to help out our neighbors. That is cherry picking. That is reading our preconceptions into the Bible. That violates the principle of interpreting the Bible by letting it speak for itself. That is wrong. Science works the same way. Say you measure the masses of multiple samples that are suppose to be identical, and get 6.45g, 6.46g, 6.48g, 6.48g, 6.50g, and 8.49g. Should you ignore that outlier of 8.49g for the purpose of computing an average? Well, upon checking your lab notes, you see that this sample was prepared and recorded by that new freshmen undergraduate intern. You know that a 6 can look like an 8 in the particular digital scales in your lab. You know that sample contamination, scale miscalibration, or a simple statistical accident are all possibilities. Based on all this, you decide to exclude the 8.49g sample data from further calculations. You're "ignoring" data, but that's okay, as it makes sense in the context of all the other data you have about this experiment, and you're still letting the data as a whole speak for itself. What you cannot do is to simply say, "I don't like this data point because it brings up the average to a higher value than my initial hypothesis, so I'm going to throw it out". These are the principles of Bible interpretation. They make good sense, they are widely accepted, and they share strong parallels with how we study nature, which is God's other "book". All these facts lend credence to their correctness. However, as this is an immensely important topic, you may disagree with some detail of these principles. And while these disagreements are important, I would like to end with a reminder that they are still not the most important thing. There is more to being a Christian than being correct about your theology, and we would be poor Christians if we valued being right over living out the Gospel. In my next post, I will discuss the use of specific scientific facts as a tool in interpreting the Bible.